There are nine Siddha Peeths, also known as Shakti Peeths, of Hindu Goddesses in Mathura which includes Mahavidya Devi, Charchika Devi, Chamunda Devi, Kaila Devi, Bagalamukhi Devi and Katyayini Devi. The Shakti Peeths are places of worship consecrated to the Goddess Shakti or Sati. Around two and a half decade back, there was no Maa Kali temple in Mathura. This temple is now one of the most popular shrines in the whole district. 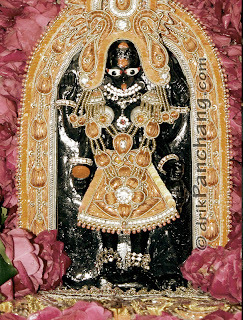 Maa Kali is the Hindu Goddess associated with strength and empowerment. In the Vikram Samvat 2015, year as per Hindu calendar, managing director of Mathura Electric Supply Company - Kalicharan Bhagat developed the desire to build Maa Kali temple in Mathura. He presented his idea to his priest of traditional shrine, Shivlokwasi Mahant Mukund Ram of Naughar. Consequently, after seeking advice from Ganesh Prasad Chaturvedi and reporter friend – Narendra, Maa Bhagwati Kali Devi temple was founded on Mahashivratri festival by performing all Vedic rituals. This temple was built close to electric company and now this shrine is renowned as Siddha Peeth Maa Kali temple. Though initially, there were lots of obstacles during construction of the building and temple expansion but gradually all were transformed to opportunities by the grace of Maa Kali. Since the establishment of the shrine, Maa Kali Devi has blessed its devotees such that all their wishes are fulfilled. Due to this shower of blessings from Maa Kali, this temple is flocked by devotees all around the year. The devotees and pilgrims visit this temple in large number during Shardiya and Chaitra Navratri. The formal establishment of this temple was done only about 25 years back but due to Maa Kali’s miracles and grace on her devotees, the recognition of this temple has become hundredfold. Recently, the expansion of this temple has been completed and idols of Sri Girirajji, Shiva’s family, brave Hanuman, Bhairo Baba and Kshetrapal have been setup in this temple, but still this temple is renowned for Maa Kali. Until 2013, three Yagyas (यज्ञ) have been organized in this temple. The first Yagya, which was conducted in the year 2007, was Panchkundiya Sahastra Chandi Mahayag . The second Yagya, which was in the year 2011, was Navkundiya Sahastra Chandi Mahayag and the third one, which is in the year 2013, is Panchkundiya Sahastra Chandi Mahayag. In the recent Panchkundiya Mahayag - Yonikund, Chaturth Kund, Ardhchand Kund, Padam Kund, Vrat Kund were made. The meaning of these Kunds are being told as - Yonikund is for son(s), Chaturth Kund is for Siddha, Ardhchand Kund is for prosperity, Padam Kund is for money and Vrat kund is the symbol for peace.